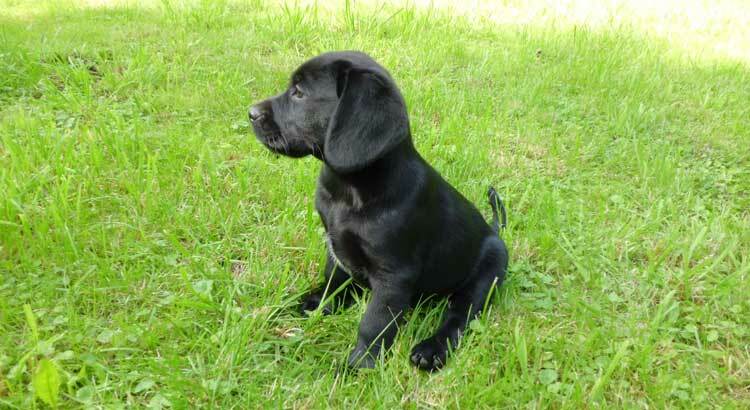 You’ve picked out an adorable new Labrador puppy and she will be coming home soon. How do you prepare for her? There are several supplies that your new puppy will need. I go into much greater detail on each of these items in my article on Essential Supplies for Your Labrador Puppy. In general, you will want to purchase a crate and barriers (gate or corral) to create an area to keep your puppy safe. It’s not a good idea to give your puppy free run of the house until she has had some training. Labradors are curious and they are chewers. Having a safe, enclosed space will help keep your puppy from harm and out of trouble. It will also give you a safe place to put her when you need to step away to do something and can’t keep a close eye on your puppy. You will need food and water bowls that are hard to tip over. Metal bowls are cheap and clean up easily. Just make sure you find the kind with the non-skid bottom. Ceramic bowls are also easy to keep clean and are generally heavier so they are harder to tip over. However, they are breakable and there is a chance your excited puppy could smack it around or knock it out of your hand and break it. Plastic bowls are not a great choice. They are too easy for your puppy to chew up. Your puppy will need some basic items like bedding to sleep on. Find something made of good sturdy material and teach her not to chew on it. You will want washable bedding as there will be many times that the puppy will get her bedding dirty and it helps if you can just throw it in the wash.
You will also need puppy food. I recommend asking the breeder, pet store, or shelter what they have been feeding her. It will help her transition better if she is eating the same food. Switching foods too quickly can also upset her stomach. If you want to switch her to a different brand of food, make sure you do it gradually, adding in just a little of the new food each day and increasing the amount over time. Most dog foods have instructions on the bag that guide you in the best way to transition your dog’s diet. It is a good idea to find a brand of puppy food that is made for large breeds as they have different nutritional needs than smaller breeds. She will also need a collar, leash, and harness. Nylon or leather are the sturdiest materials for these items. I recommend purchasing a harness to attach the leash to, rather than just attaching it to the collar. Your puppy may be able to slip out of her collar and get away from you. Also, if she pulls too hard on her leash while attached to her collar it can damage her throat. There are several grooming items that you will want to have on hand. Make sure you have puppy shampoo, brushes, toothbrush and toothpaste, nail clippers and scissors. There are several different types of brushes you may want to purchase to help brush out your Labrador’s coat and to help minimize shedding. The different types are a rubber curry brush, an undercoat rake, a shedding blade, a wire slicker brush, and a bristle brush. Each of these has a specific function and can help remove all of that shedding hair. 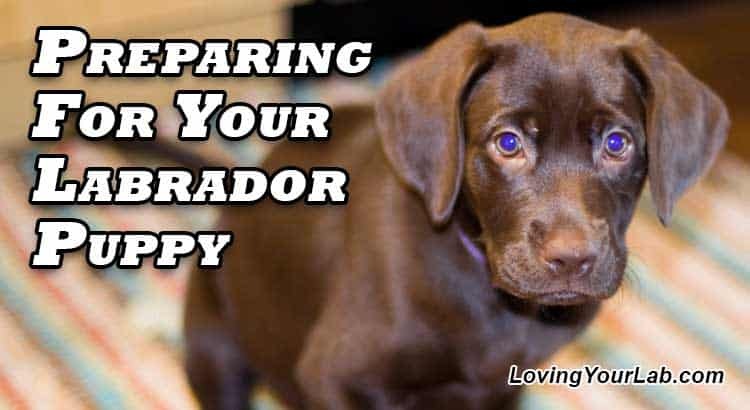 If you want to feel like a pro when it comes to grooming your Lab, you’ll definitely want to check out my article, Ultimate Labrador Grooming Guide, where I go into much more detail about brushes, supplies, and important grooming methods. You will also want to purchase shampoo and conditioner created for a dog as the ph balance is specially designed for dogs, rather than people. It is also important to buy toothpaste specifically made for dogs. Never use toothpaste designed for people on your dog as many of our toothpastes contain xylitol, which is a chemical that can be very harmful to your puppy. You will want to purchase a few toys to occupy and entertain your puppy. We just brought home our new yellow Labrador, Scout, a few weeks ago. She is the first puppy our family has ever owned. (we rescued our Black Lab, Trooper as an adult) and we weren’t sure what toys Scout would like. So far her favorites are tennis balls, rubber bones (such as a Nylabone), and soft stuffed animals that squeak. We also found a few rubber toys that we can put treats in. She loves these and will chew on these for a long time trying to get the treats out. She likes to chew on the little stuffed animals but she has one larger one that is pretty flat that she likes to sleep with. She is surprisingly gentle with that one. You should only give your puppy access to a few toys at a time so as not to overstimulate her. You will also need potty training supplies. You will want to have plenty of puppy pee pads on hand as well as a spray cleaner that is made to remove the odors left behind when your puppy has an accident. We use a product called Nature’s Miracle and have been very happy with it. Lastly, you need to get your puppy an ID tag. If she happens to get lost an easy-to-read ID tag with your puppy’s name and your phone number will make it easier for someone to return her to you quickly. There can be a lot of dangers to your new puppy throughout your home. Your puppy has no idea what can cause her harm. She doesn’t know that electrical cords can shock her if she chews on them. She doesn’t know that the stairs are steep and that she can fall down them and get hurt. She also doesn’t know what is safe to eat and what can make her sick. It’s up to you to protect her. It may sound silly at first but it is a good idea to get down on your hands and knees and look around your house to get a puppy’s-eye view. You will see all the tempting cords, furniture, clothes, drapes, etc. – all the things that a puppy will want to chew or pull on. Move as many of these items out of her reach that you can and try to hide electrical cords. Put all shoes away and keep clothes off the floor. Block off stairs so she can’t get to them. Try to remove as many temptations as you can. Also, look for small places where your puppy can get stuck or lightweight furniture that can be easily pushed over. Try to remove as many dangers as you can. There are several human foods in your house that can be toxic to your dog and you need to make sure that she can’t get a hold of them. Many dog owners would be very surprised to find out how many of the foods they eat can be dangerous to their dogs. I list many of them in detail in my article, 19 People-Foods You Had No Idea Could Harm Your Dog. You may be feeding some of these foods to your own dog! In general keep in mind that that the following human foods can be toxic to your dog: chocolate, onions, alcohol, coffee or tea, macadamia nuts, grapes, garlic and xylitol (this is an artificial sweetener found in many candies and gum as well as toothpaste). If you think your dog has eaten any of these items contact your vet immediately. The faster you get treatment the more likely the vet can help your dog. If your dog gets ahold of leftover food, especially food that may have gone bad or has bones in it, make sure you contact your vet. Bones can break off and cause major problems in your puppy’s throat and tummy and expired or aged food can cause all sorts of stomach issues. There are many other items, besides food, in your home that can harm your puppy. Household cleaners of all types can be toxic to your puppy. Pesticides that you may spray around to get rid of ants, spiders, and other pests can also be toxic. Medications that we normally take, like acetaminophen and ibuprofen, can be harmful to our dogs. If you think your puppy has ingested any of these items, take her to the vet immediately. Kitty litter and cat feces can be dangerous for your puppy. If you have a cat make sure its litter box is put somewhere that the dog can’t get to. Trash cans should also be kept out of reach or closed as there are many things you throw away that could harm your puppy. You should also keep bathroom doors closed or at least keep the toilet lid down. Puppy’s love to drink water from the toilet and leftover cleaning chemicals can make them very sick. There are also many household plants and flowers that can be poisonous. The list of plants with parts that can be poisonous to your puppy is quite long. Do your best to keep all house plants out of her reach or look them up online to find out if they are safe if ingested by your puppy. If your puppy ingests anything that you aren’t sure about, call your vet or the Animal Poison Control Center at (888) 426-4435. Labradors are chewers. Your new puppy is going to try to chew on almost everything in your house – chair legs, couches, hair, clothes, trash, etc. It will take time and patience but you need to help her learn what she can chew on and what she can’t. Every time she chews on something she shouldn’t tell her “no” and redirect her to a toy that she can chew on. You may want to use a bitter spray, like Bitter Apple, and spray it on items that your puppy continually chews on. This is a non-toxic spray that tastes bitter and helps deter your puppy from chewing. We have used this on our puppies leash and it seems to help. There are also chew toys that dispense treats, These can be great distractors from other items and they can keep your puppy chewing for a while. These dangers are all reasons that your puppy should not be allowed to roam unsupervised in your house. Puppies need lots of supervision. It’s important to keep them in a safe space or supervised at all times until they are trained. Make sure your house is set up for all of this. As mentioned above your Labrador puppy will be much safer in a space of her own. Maybe you have a room that you can keep her in by means of a gate. Some people use their bathroom or kitchen. Make sure there are no hazards that your puppy can reach if she is alone in this space. A room or space with tile or linoleum floors will be much easier to clean up when your puppy has accidents. I would highly recommend using a gate to secure your puppy in a room rather than closing a door. Labrador puppies have sharp claws and can do a lot of damage to a closed door. There are many benefits to keeping your puppy in her own space. It keeps her away from items that she may want to chew on. If she’s in her space you can control what she has access to play with and chew. You can introduce her to different chew toys and she will start to learn what she is allowed to chew on. It also helps with potty training as she will be in a smaller space with her potty pads easily accessible. You can let her out when you are able to closely supervise her and keep her out of trouble but other than that she should spend regular amounts of time in her space. 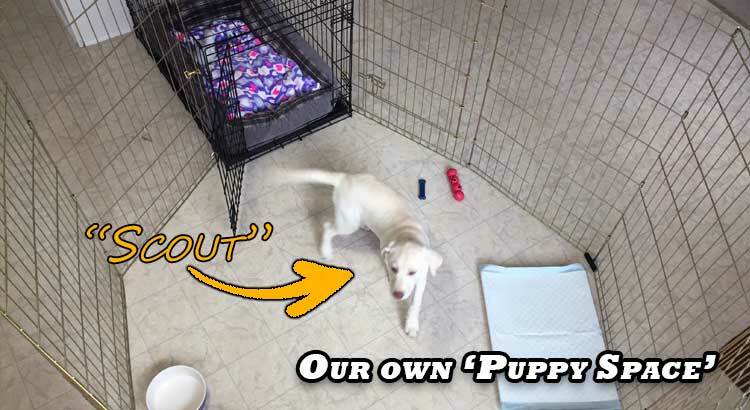 We didn’t really have a room that would work well for this so we created a space for our puppy, Scout (see our own “puppy space” layout in the image above). We bought a puppy fence and placed it in the breakfast nook area connected to our kitchen. Since the floor in our breakfast nook is linoleum, cleanup is relatively easy whenever she has accidents. We fastened the fence to her crate so she can retreat there whenever she wants. In the corral area, we set up her pee pads and a place for her food and water bowls. This way she is free to come out and relieve herself or eat, but can also retire to the crate when she wants to sleep. You will also need to decide what areas you would like your puppy to use to relieve herself. You should have an area prepared in the house with puppy pads or newspaper. If you want your puppy to stick to peeing/pooping in specific areas outdoors make sure you know what that area is and take her there every time you take her outside. Whenever she pees outdoors or uses her pads, make sure to praise her and give her rewards. You and your family need to decide what rules are important to enforce with the puppy as well as what routines you would like followed. It is important to have everyone enforce the same rules and routines so that the puppy doesn’t get confused. Everyone in the household should enforce the same rules in the same way. Consistency is key when training your puppy. Having consistent and regular routines set up for your puppy helps to train her. She will learn when she gets fed, taken outside and played with. This will help her know what to expect and also learn the behaviors expected from her. Your puppy has no idea what is ok to do and what isn’t. She needs the rules set out clearly by her new family. Making sure everyone in your home understands these rules before your puppy comes home will help your family be prepared and consistent. What should you do to prepare your yard before the puppy arrives? The first thing you need to do is check out your backyard. Make sure your fences and gates are in good shape. There shouldn’t be any weak spots in the fence and your gates should latch securely. Also, look for any holes in the fence or in the ground near the fence. Your puppy may discover a hole in the ground and dig further to try to escape under the fence. You also want to make sure there is nothing next to your fence that your puppy can jump up on and then get over the fence. 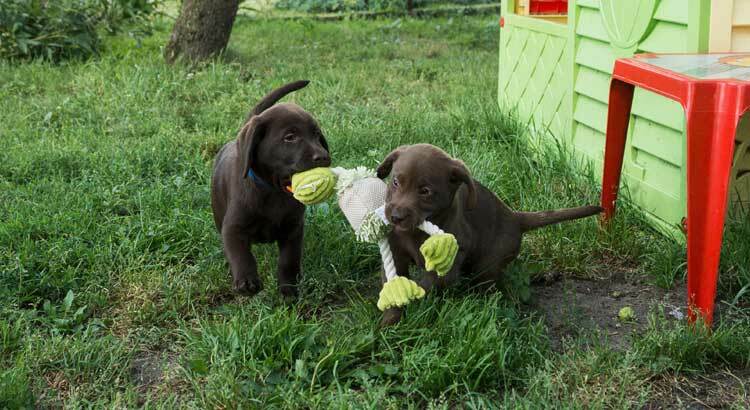 Puppies are curious and they will look for any way to get out of the yard and go exploring. Some people like to use electronic fences. I personally have never been a fan of these. Some issues to keep in mind with these are that they may keep your puppy in the yard but they won’t keep other animals or people out. A person or predator could still come in your yard and try to take or hurt your puppy. Also, some dogs have been known to push through the discomfort and go ahead and go through the electric fence. Once out, they won’t usually come back because they don’t want to go through the discomfort again. In my opinion, the best way to keep your puppy safe in the backyard is to supervise her. Even if your yard is enclosed there are all sorts of things that she can find to get into. We, unfortunately, don’t have a backyard fence. We have used this as an opportunity to begin leash-training our puppy. So far she is doing pretty well. As long as she has the leash on she is free to run around and we don’t worry about her escaping. Your puppy should not be left in the backyard for long periods of time. Labradors love being with people and when they are left alone they tend to get bored and anxious. Under these conditions, she may try to escape. If you do have to leave her outside for a little while, make sure she has a few toys and plenty of water. Labradors really prefer to be indoors with people, so keep that in mind when choosing your dog. As mentioned earlier, many plants are poisonous for dogs or have poisonous parts. Your adult Lab may leave all of your plants alone but a Labrador puppy is likely to chew anything. Make sure you look up any plants that are planted where your puppy can access them and remove them if they are poisonous. Always watch your puppy in the yard and divert her when she tries to chew on plants. It’s better to train her not to stay away from all plants since you never know what plants she may come across in places outside of the home. There are several substances used by people outdoors that can be poisonous to your dog. Rat and mouse poison, insecticides, fertilizers, and slug and snail bait are all quite dangerous for your pet. If your puppy ingests any of these items get her to the vet immediately and bring a sample of what she swallowed so your vet can give her the correct treatment. Some insecticides and weed killers that are sprayed on the lawn can actually be absorbed through your puppy’s paws, so make sure that you don’t let your puppy wander across treated grass unless you know the product is animal safe. Your puppy can also ingest weed killer and insecticides by licking herself after playing on the grass or by eating a dead insect that was killed by a pesticide. If you think your puppy may have ingested a poisonous chemical watch for vomiting, diarrhea, loss of appetite, balance issues, twitching, foaming at the mouth, seizures, weakness, or paralysis. If you see any of these signs get your puppy to the vet immediately. Antifreeze can also be deadly for your puppy. Many times this drips from peoples cars and your puppy finds it. Antifreeze tastes sweet to your puppy so her first inclination will be to lick it up. Watch your puppy carefully when she is outside around cars or places where cars have been parked. Symptoms of antifreeze poisoning don’t usually show up until about 12 hours after ingestion and by then it is usually too late. If you think your dog has ingested antifreeze get her to your vet. Early treatment can save your puppy’s life. 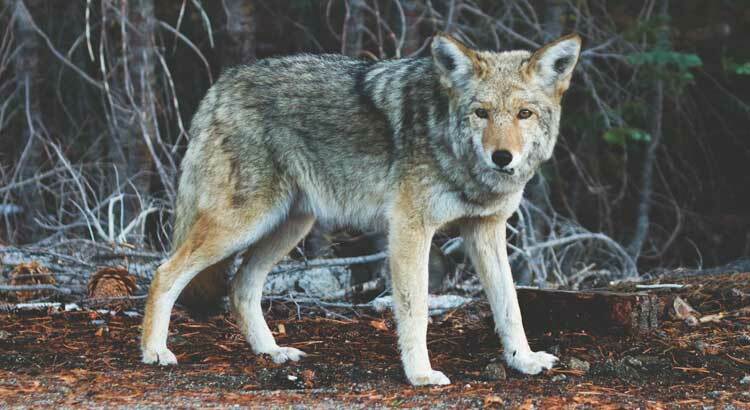 Depending on where you live, and how much time your puppy spends alone in the yard, predators can be an issue. If you live in a place where snakes, coyotes, foxes, etc. are common, you need to protect your puppy from these dangers. Make sure you have fences to keep predators out and remove wood piles where snakes can hide. When you are walking with your dog keep an eye out for snakes and do your best to steer her away from places they can be resting. If your puppy happens to get bit, stay calm. Often times snakes don’t release venom if they are just giving a warning strike. Call your vet and let her know what has happened and take your puppy to the vet immediately. Try to learn what venomous snakes live in your area and what they look like. Knowing the difference between venomous and nonvenomous snakes will prove helpful if your puppy is ever bit. Most Labs love the water and so a swimming pool is an instant temptation. Even though most Labs are excellent swimmers they can still drown in a swimming pool. Your puppy may jump in and then not be able to find the stairs to get back out. If this happens she can tire out and drown. If the pool is covered your Lab could try to get in and get trapped under the cover. All pools and hot tubs should be fenced so that your puppy can’t gain access to them by herself. It’s fine for your puppy to go for a swim as long as there is someone there to supervise her and make sure she can get out easily. If you have any other pets in the house make sure they are shut away when you first bring your puppy into the house. You will introduce them in a short while but you want your puppy’s first moments to be calm. It’s also important for everyone in the house to remain calm. If you have small children, make sure you instruct them on the best way to meet the puppy. Everything is new to the puppy so she will be scared and unsure. Do everything you can to make coming into her new house a calm and welcoming experience. The very first thing you should do is take her to her potty area and let her relieve herself. This may happen quickly or it may take a while. As soon as she goes make sure you praise her and perhaps give her a treat. This will help get potty training off to a great start. Be patient and give her time to urinate. This is all new to her and she may be a little scared or nervous. Take your puppy to the area you have prepared just for her; the area that is blocked off where she can wander around safely. Allow her to investigate the area and sniff everything. Give her time to locate where things are. After a few minutes, you can allow the family to enter her area one at a time to meet her. It’s a good idea for them to sit or kneel so they are closer to her level. This way she won’t feel intimidated. Each family member should wait for the puppy to come to them. Let her sniff each person and tell them not to scoop her up right away but to give her time to get to know them. All of this excitement is bound to wear your little puppy out. If you notice that your puppy seems tired, let her sleep. You may have to hold off a few introductions while she gets a nap and then resume them when she wakes up. Your puppy needs a lot of rest and you don’t want to overtire her. If the puppy is adjusting well you can go ahead and introduce your other dogs. However, if the puppy seems stressed hold off a day before you do this. When you do introduce them it’s a good idea to do it outside in a neutral area. Stay calm and give them all a chance to sniff each other. If any of the dogs start to seem stressed or act aggressively then go ahead and put them back in their own areas. It may take time for them to get along, just be patient and encouraging. At the time of this writing, we have had our new puppy for over 3 weeks now and our two older dogs still aren’t too sure of her. She wants to puppy-play and they just want to lay around and be left alone. Their interactions are getting much better, however, and I am sure in time they will all be best of friends. If you have a pet cat the adjustment will be different. Ideally, the cat and dog are introduced when they are little. However, it’s rare that both animals are babies when they are introduced. Keep in mind that even though your cat can scratch the dog if it feels threatened, it is very rare for a cat to seriously injure a dog. On the other hand, your dog can seriously injure your cat because the dog is usually bigger and stronger. The best way to introduce them is to make sure the cat has somewhere he can go to get away from your puppy. Keep the puppy as calm as possible during her interactions with your cat. Whenever the dog gets too hyper, allow the cat to go to its safe place. Over time, the dog will be calmer around the cat and they will probably learn to tolerate each other. To help completely prepare you for this encounter, we’ve put together a Complete Guide to Introducing Your Lab and Cat Safely. This article has plenty of helpful tips and we trust will give you all the information you need for introducing your cat to your new Labrador. What will those first few days be like? Every puppy is different. Some may be hyper and want to play all the time, others may be unsure and just stay back and watch everything going on. Some puppies may sleep really well at night, while others may cry every few hours. There isn’t necessarily one standard behavior with puppies. Be patient and give your puppy time to adjust to her new surroundings. If you can, try to be home with your puppy for the first few days. This is an adjustment time for both of you. She needs to learn that you are the caregiver and that you will be taking care of her. Use the first few days to start establishing routines. Have set times for feeding, playing, and sleeping. Take her outside frequently to give her a chance to relieve herself. This will help to start teaching her that this needs to be done outside. Your puppy will need time to explore her area. Make sure she is supervised anytime she is outside of her enclosed space. She will want to wander and you need to keep her safe. Let her sleep when she needs to and for the first few days keep her as calm as you can. Once she feels comfortable and secure with her new family and environment, you will see her personality begin to come out. During the first few weeks, the main thing you will be teaching your puppy is her routines. She will learn when it’s time to eat, play, and sleep. I’m not saying these have to all be done at exactly the same times every day but it will help if you can stick to a fairly regular schedule. Having a regular schedule helps your puppy to feel secure. If things are continually changed or moved then your puppy can get confused and feel stressed. Try to make things as regular and normal as possible and keep things in the same places. Routines also help regulate your puppy’s inner clock and will also help with potty training. Your puppy will learn the word “no” fairly quickly. You will be saying it a lot! I think our puppy may think that her name is No. When you have to tell the puppy no, make sure you also redirect her to behavior that is allowed. If she’s chewing on your shoe, tell her no, then give her a chew toy. Your puppy is learning what is and isn’t allowed. She has no idea what behavior is dangerous or damaging. You have to teach her everything. Lots of interaction is important for your puppy to learn things quickly. The key is patience and consistency. At this point your puppy is probably not ready to start learning commands – her attention span is still too short for that. However, she can learn what she can chew, where she can potty and where she sleeps. When she is about 3 months old you will begin with short, five-minute training sessions. Teaching your Labrador to obey basic commands will spare you from years of frustration and embarrassment. You can learn about how basic Labrador training in our article, 8 Basic Commands Every Labrador Should Know. It’s important to pick a good, nutritional food for your puppy. As I mentioned at the beginning, you should give her the same food the breeder, pet store, or shelter was feeding her. This will help prevent any stomach issues. If you would like to change the food you need to do it gradually. Most dog foods have instructions on them about the best way to switch the food over time. You can ask your vet for pet food suggestions or just read the labels and pick one yourself. Puppy’s need a lot of protein and not as many carbs. It is a good idea to find one that is made for large breed puppies as they have different nutritional needs than small breed pups. Puppies need a lot of food, but you have to be careful not to feed them too much. Our puppy constantly acts like she’s never fed! Check the dog food bag. It will tell you how much your puppy should eat depending on her age and weight. If your puppy is like ours, she will inhale the food and then look at you like you never fed her. If you’re wondering if your puppy is getting enough to eat here is a helpful and practical tip: You shouldn’t be able to see her ribs but you should be able to feel them. If there is extra padding and you can’t feel her ribs very well then you can probably cut back. If her ribs are too visible then she’s not being fed enough. Puppy’s feedings should be spread out between 2 to 3 feedings a day. Try to keep these feedings around the same times each day so that she knows when to expect them. This will keep her body on a regular schedule and help with potty training as well. I know there are people who disagree with me but I believe that a puppy should sleep in a crate or in her enclosed, safe area. This keeps her out of trouble throughout the night and will even help with potty training. It also helps to ensure you get a good night’s sleep as you will know that your puppy is safe and she won’t keep you up most of the night. Our puppy sleeps in her enclosed area every night. This means she has access to her open crate where she can sleep comfortably, as well as access to her play area and potty pad. From the second night, we had her she has slept very well and usually doesn’t wake up until we do in the morning. If you wish, you can keep her crate in your bedroom so that she will be close and you will hear her if she wakes up and needs to go out. The first few nights can be rough for a new puppy since she has become used to sleeping with her littermates and is now must sleep alone. She may whine and cry a lot the first few nights. We bought a stuffed animal for our puppy and she started cuddling up to it right away. The first night was a little tough for her but she adjusted very quickly. We recommend that your puppy sleep in her crate or safe area at least until she is potty trained and doesn’t chew on things she shouldn’t. Once she has learned those things you can decide if you want her to sleep in a dog bed somewhere in the house or even in your bed. 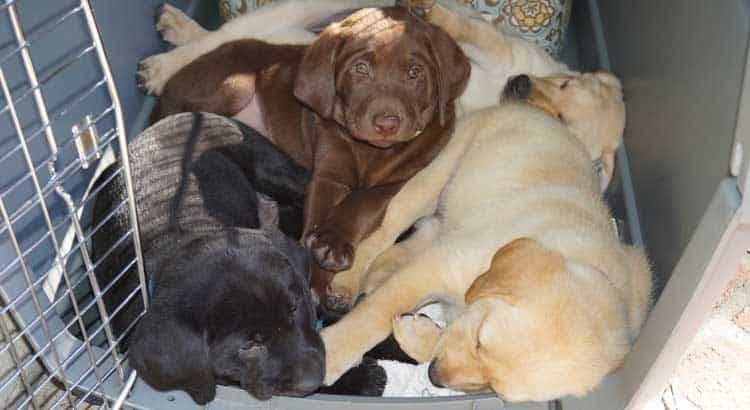 Remember Labs get to be quite large so don’t let her sleep in your bed when she’s little unless you plan on letting her continue this habit into adulthood. It can be a hard habit to break. Some people choose to have their dogs sleep in crates every night and that is fine too. If you already own a dog then you hopefully have a veterinarian that you like. If this puppy is your first dog, you should do some research to find a good vet in your area. Ask other dog owners and check Yelp reviews. Don’t be afraid to call several local vets and ask lots of questions. You can even request a tour. Once you try out a vet you can easily switch if there were things you weren’t happy with. I say this because I am one of those people who hates to call and bother people with lots of questions and who hates to switch once I start going somewhere (even if I’m not happy). I have learned over time that it’s ok to do these things. You want to find the best care for your animals. Also, the best vets will be happy to answer all your questions. You should take your puppy for her first vet visit within the first week. Most puppies will have already had at least one vet visit before you take them home. Certain treatments are required before they are old enough to be adopted. On your first visit, the vet will do a thorough first-time check-up. They will give any shots that are needed and will usually make sure your puppy doesn’t have worms. Good veterinary care is crucial. There are many vaccinations your puppy will need throughout their life and it’s good to start her off on the right foot. Be vocal about all questions and concerns. Remember to ask your vet for a good heartworm treatment as well as flea and tick prevention. There are a few other challenges you can prepare for with a new puppy. Labradors do fairly well in most weather – although, they do better with cold weather than with hot. But there are things to plan and prepare for. Labradors have thick double coats and most of them love the cold. However, if your Lab has to spend a lot of time in frigid weather make sure she has a shelter she can retreat to when she feels cold. Your dog’s shelter should be insulated. If you live in a region with extremely cold temperatures it’s a good idea to have the shelter heated as well. She should also have access to plenty of water in a place where it won’t freeze. You don’t want your dog to get dehydrated. Snow is not a substitute for water. It takes time for snow to melt in your Lab’s mouth which makes it hard for her to get enough water from it. Also, the snow lowers the dog’s body temperature which works against her getting warm. Keep a close eye on your puppy if you live near any bodies of water. Most Labradors love water and she may go charging toward her regular swimming hole and not realize it’s iced over. Thin ice can be extremely dangerous for your puppy. 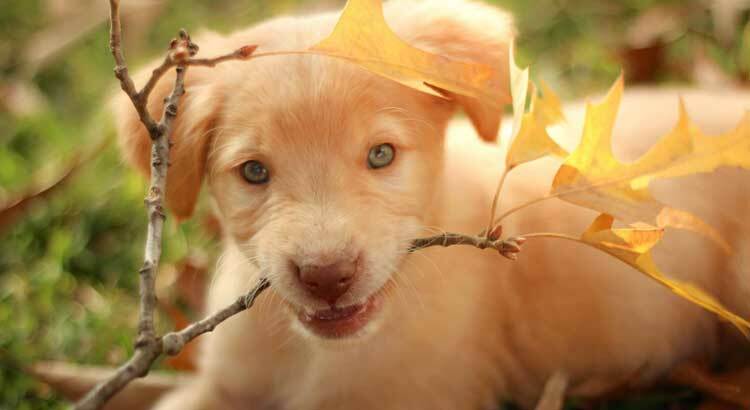 If your puppy is regularly outside and active during winter she will need more calories in her diet. Her body will burn energy faster so be sure to increase her food intake. Many chemicals and sidewalk salts that are applied to snowy and icy walkways can be poisonous to your dog. If your puppy will wear booties outside this will help protect her feet. If not, make sure you clean her paws thoroughly every time you bring her in and dry them off well. Summer can actually be harder on your puppy than winter due to the fact that your Lab can’t sweat to release heat. Your puppy will need lots of shade when she is outside and plenty of cool water to drink. 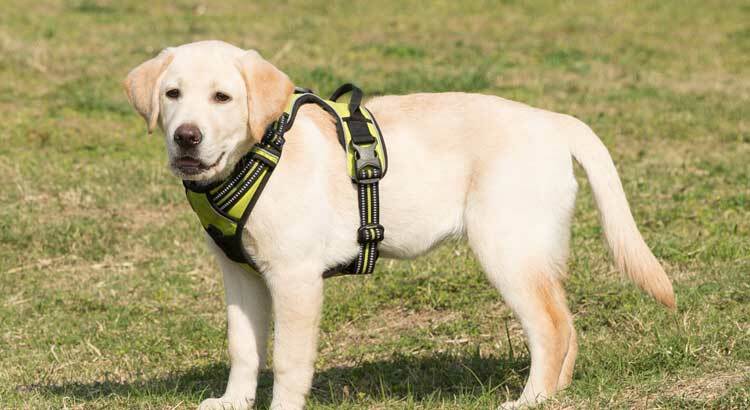 The best temperature for a Lab is around 65 degrees F. If it is hot outside try to monitor your puppy’s activity and don’t leave her out in the sun for too long. If you notice that your puppy’s tongue is bright red, that she is salivating a lot, and that she is breathing noisily, these may be signs of heat stroke. Take her inside or into the shade and pour cool water over her. You can also cover her with cool, wet blankets. It is important to take her to the vet as she may need IV fluids to help her recover. Your puppy will love going anywhere you do. When it is hot outside you should leave her at home. You should never leave a dog alone in a hot car even if the windows are cracked. The heat in a car rises very rapidly, which can be deadly for a Lab. You won’t be able to take your puppy with you everywhere you go. It’s important to have a plan for when you aren’t able to travel with your dog. There are two basic routes you can go – a boarding kennel or a pet sitter. Boarding kennels can be a good option when you have to leave your puppy behind. They tend to be booked up quickly during the summer and holidays so plan ahead. Some vets offer boarding services and this can be a good option since your vet and staff members will already be familiar with your puppy and her needs. It’s also a good idea to visit the kennel ahead of time and make sure you like what you see. The best kennels have a friendly, knowledgeable staff. They are clean and the animals that are boarded there will seem well cared for and content. They will also allow you to bring your puppy’s food and a few toys along with her. You can hire pet sitters who will come to your house several times a day and take care of all your puppy’s needs. This is also a good option, but the drawback is that your puppy will also be alone for a good part of each day and every evening. The ideal option is a pet sitter who can stay in your home with your puppy. You may be lucky enough to have a friend or family member who is willing to do this. This way, there is someone there with your puppy most hours of the day who you trust, and who can feed her, play with her, and take her for walks. Don’t Underestimate the Emotional Challenges! Raising a puppy is emotionally hard! This is a challenge I personally want to mention. Surprisingly, I never saw this important fact addressed in any of my research and preparation for this article. Bringing a new puppy into your home is a huge obligation. They need constant care and training. There will be days when they pee everywhere. There will be mornings that you wake up to poop all over your puppy and the kitchen floor. There will also be nights of disrupted sleep and very early mornings. All of this does take an emotional toll. Make sure you are mentally and emotionally ready for this. Be patient and keep reminding yourself that the “puppy stage” only lasts for a short while. I tend to be a pretty emotional person and I’ll admit there have been times I have broken down crying from being tired and frustrated. However, I am seeing remarkable results from the routines and early training we are doing and I know she is learning to be a well-behaved, energetic Lab! As I said, bringing a new puppy home is a huge obligation. Being prepared is key! Make sure you have all of the supplies you need beforehand. Have your house and yard prepared so you aren’t scrambling trying to get things out of her way at the last minute. Have an area prepared for your puppy where she can be safe and comfortable. Make sure your family is on the same page about rules and accepted behaviors. Read up on Labrador puppies so that you know what can be expected. Your new puppy will bring a lot of joy and love to your life but it will take hard work to get her trained and well-behaved. Be prepared for these challenges as much as you can and try to stay calm and consistent. We’re convinced it will all be worth it! Click on one of the Share Links below to share it with a friend. How Smart Is My Labrador? How Much Do Labs Cost? 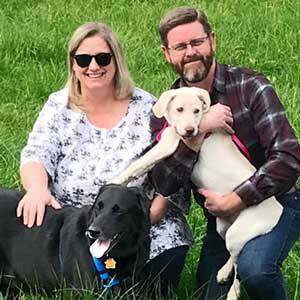 We’ve spent a lot of time, money, and trial-and-error making sure our Labradors, Trooper and Scout, are happy and healthy. We’ve created this website, put in the research, done the legwork, and made the mistakes so that you don’t have to!